Apache Falcon is a data governance engine that defines, schedules, and monitors data management policies. Falcon allows Hadoop administrators to centrally define their data pipelines, and then Falcon uses those definitions to auto-generate workflows in Apache Oozie. InMobi is one of the largest Hadoop users in the world, and their team began the project 2 years ago. At the time, InMobi was processing billions of ad-server events in Hadoop every day. The InMobi team started the project to meet their need for policies to manage how that data flowed into and through their cluster—specifically for replication, lifecycle management, and data lineage and traceability. This became the Apache Falcon incubator project in April 2013. Since it became an Apache incubator project, three Falcon releases have resolved nearly 400 JIRAs with contributions from many individuals in the open source community. Apache Falcon will ship with Hortonworks Data Platform version 2.1. 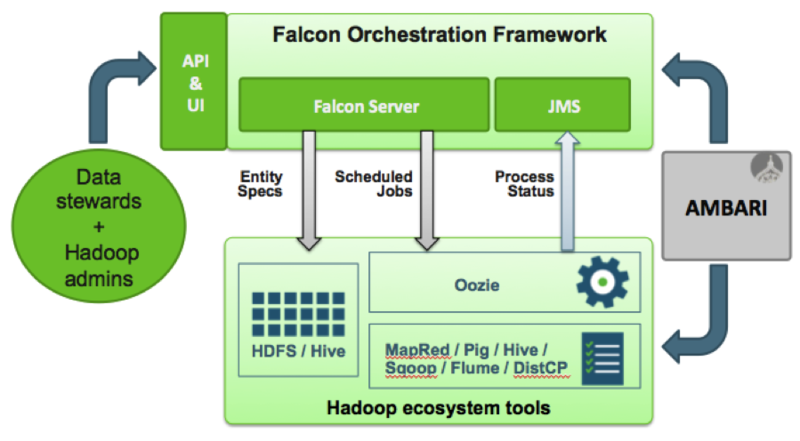 This is the first time that Falcon will be included in a top-tier Hadoop distribution. Although Falcon is a newer addition to the Hadoop ecosystem, it has already been running in production at InMobi for nearly two years. InMobi uses it for various processing pipelines and data management functions, including SLA feedback pipelines and revenue pipelines. What does Apache Falcon do? Trace pipelines for dependencies, tagging, audits and lineage.